I first started noticing this Sweet Woodruff when I was young and obsessed with the herbs used in Elizabethan times for nosegays and for strewing on the floor, to cover the rather unpalatable odours that would have been wafting around. John Gerard, in his herbal of 1597 remarks that woodruff ‘doth very well attemper the aire, coole and make fresh the place, to the delight and comfort of such as are in therein’. It was said that a spray of Sweet Woodruff, given by Queen Elizabeth to a subject was a mark of special, if temporary, favour. The scent from this rather unassuming little plant is of new mown hay (rather like vanilla with a hint of almond) which persists even when dried (I used to place sprigs inside the airing cupboard and in the pages of books). 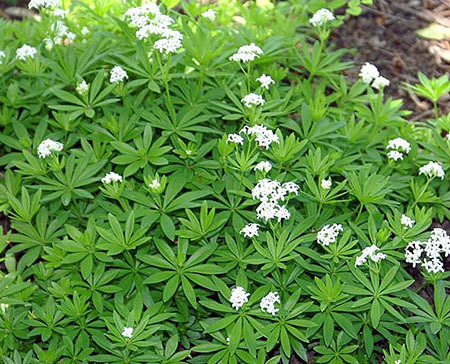 Sweet Woodruff was also widely used in Medieval herbal remedies ‘for making of the herte merry’, being steeped in wine for summer drinks (although that was probably because of the alcohol rather than the herb) and is still used in Germany as the main flavouring for May Wine. Incidentally, its close relation Galium verum – Lady’s bedstraw, was used to stuff mattresses, it being considered a flea repellent. It wasn’t until a few years later that I discovered what a charming plant Galium odoratum was; ideal low-growing ground cover under trees, with light and bright green leaves in whorls topped with small white flowers in spring, it always looks fresh and lush, an attribute in high demand for dark shade under trees. In fact, in perfect conditions (shady, damp and rich soil) it can be a bit of a thug, spreading by its barely submerged stolons, and overgrowing any small buried treasures. It can however easily be kept in trim by pulling up unwanted interlopers. It seems to be resistant to deer, rabbits and other predators (such as those fleas), which is down to the chemical that causes the scent – coumarin - which although smelling sweet, has a bitter taste. Coumarin was isolated as a chemical compound in 1820 and first synthesised by William Henry Perkin in 1856, a British chemist who whilst trying to synthesise quinine for the treatment of malaria, serendipitously discovered – at the age of 18 - the first synthetic organic dye mauveine, an intense purple which became the first mass-produced and stable textile dye. Perkins discovery laid the foundation of the synthetic organic chemicals industry and revolutionised textile manufacturing and fashion. Synthesised coumarin is now used in over 5000 different cosmetics and household products, a far cry from the modest and pretty Sweet Woodruff.